Want to get away for a luxury private cruise in Alaska? Make a list of 8 of your closest friends and family for an all-inclusive cruise of Alaska’s Inside Passage. This will be a cruise you will never forget! Life has special occasions that deserve special celebrations. Whether it is for a milestone birthday, honeymoon with the wedding party, an anniversary, family vacation of just a group of friends that are finally getting around to that dream group vacation, we are here to help you make the occasion special. Alaska is a place of wonders, one that conjures many ideas and fantasies about the rugged beauty of nature and the world around us. It is a place to not only see but experience, with all five senses. You must escape the confines of roads and take to the sea, to truly experience the remote quiet that is this wonderful place. And an Alaska private yacht charter is the perfect way to do this, allowing for your inner Magellan to come forth. Take to the fjords and straits like an unstoppable explorer, and to see this area on your terms. Our ship can accommodate 8 – 12 guests. Along with a crew of five aboard you will find this charter is more intimate and custom tailored to you than any other small cruise available in the area. 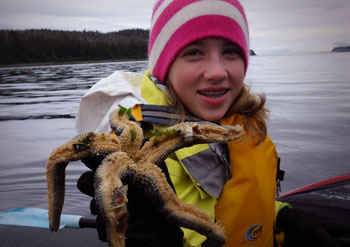 This enables us to offer first class, customized service, while you truly experience the beauty and adventure of Alaska. Our crew members have many long standing ties to the area that range from years of professional experience, all the way to childhood memories out on ships in these waters with their fathers. They know the lay of the land, the best coves to explore, the history of the area and the local input you can’t get anywhere else. When you private charter one of our boats, the ship and crew are yours for the week. Our flexible schedules and routes mean we will tailor the trip to your group’s liking. We typically cruise between Juneau and Petersburg, but work with our guests to make sure their chosen route is the best for them. The focus of your time is up to you and your cruising party. If you want to concentrate on kayaking and seafood feasts, fishing for Salmon and Halibut or just laughing and enjoying wine with your friends on deck, that is what we will do. Alaska is full of wilds and adventure abounds. We can always make suggestions, but ultimately you choose how your time is spent and where it is spent. We will work with you to ensure that this is truly an experience of a lifetime. A private yacht charter aboard one of our luxury boats will have you feeling like the King/Queen of the world, as you explore, relax, wine and dine, all on your own whims. Enjoy the freshest fare from our onboard chef, who was trained and mentored directly by celebrity chef and restauranteur John Besh (who we have had the pleasure of hosting aboard the ship many times). With a focus on fresh ingredients, southern influences and local cuisines, you will be enjoying a truly 5 star dining experience while aboard. But rest assured, even your pickiest of eaters, aka your children, will have delectable fare to choose from. Personal dining preferences, dietary needs and allergies are all taken into extreme consideration and precaution when planning for our trips. Special occasions give our chef the opportunity to delve into pastries and cakes, bringing celebrations to a whole new level. And if you enjoy cooking, our open galley kitchen will provide plenty of room to comfortably assist and visit with our chef, and maybe learn a few tips and tricks along the way. Our newly renovated Salon provides lounging comfort as the nights wind down. Enjoy some wine over board games, photo re-caps and good old-fashioned story telling with your friends and family. While most do not think much of the nights of a cruise, we have noticed that the nights on a private charter are some of the most magical moments. With friends and family creating lasting memories of shared stories and laughter they will fondly look back on for years to come. At the end of the night, retire to one of our 4 staterooms. Each features a private head, queen memory foam mattresses with plush down comforters (we have alternative fill as well for allergy sufferers) and a pull down bunk to accommodate sleeping needs. Our staterooms provide the ultimate tranquility to dream the adventures of tomorrow. 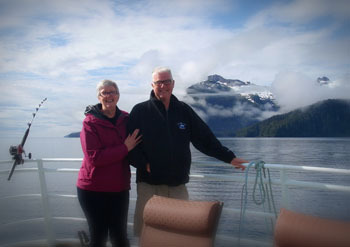 You will find your charter with Custom Alaska Cruises is first class from start to finish. And we hope to help you explore this place we love so.